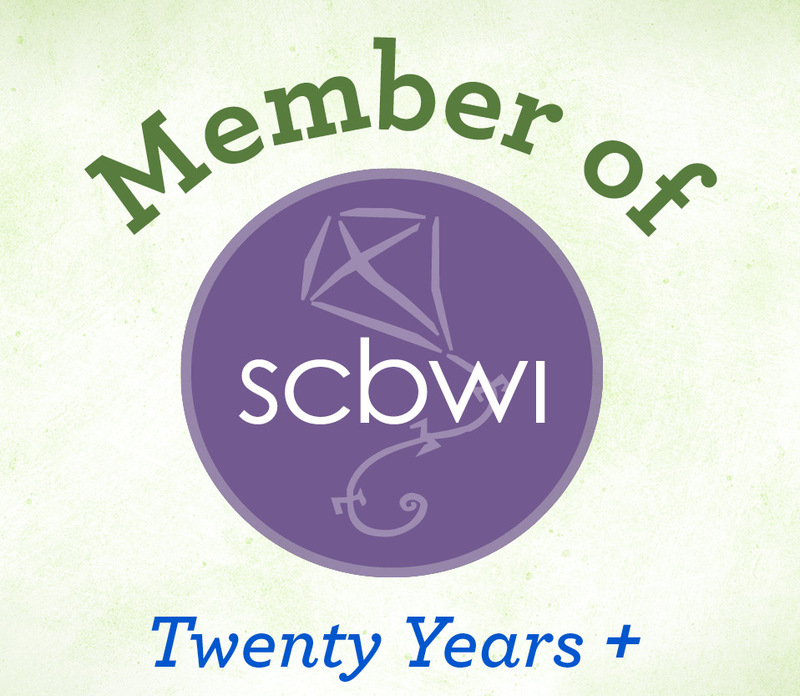 Whether you are reading blogs or attending a conference, writing advice flows fast and free. The problem is that not all of it is especially good. How do you decide which advice to listen to and which to ignore? Act Like a Professional. First and foremost, if you are trying to make a place for yourself in the publishing community, treat it like business. Act like a professional. If acting on this advice would cast you in an unprofessional light, than don’t. Be Honest. This is, in my loud and not-humble opinion, a must if you are acting like a professional. If someone tells you to shop for a new agent before leaving the one you have, consider if this seems honest. If someone says that its okay to simultaneously submit without revealing this fact, ask yourself the same question. Editors and agents talk. You don’t want to develop that kind of reputation. Consider the Source. As in research, look at the source. An unagented writer who wants to tell you how to approach an agent has less credibility than an agented author. A novelist may or may not know what works in a picture book topic and what doesn’t. If you have two contradictory pieces of advice, take the advice from the pro. Unfortunately, inexperienced people are often very forceful in sharing their unproven ideas. Go for a Good Fit. 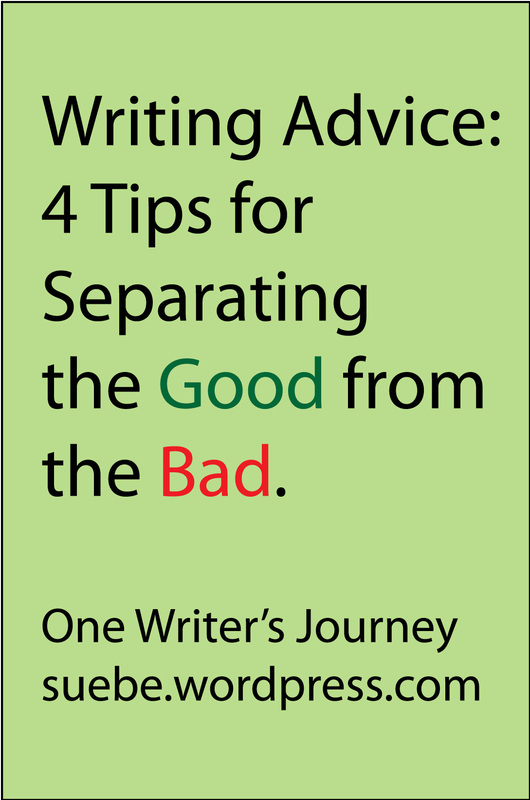 Last but not least, consider whether or not this advice fits where you are in your writing career. For more on this last item, check out my blog post tomorrow at the Muffin. Print vs ebooks: Which Is Better? Which is better? A print book or an ebook? It may depend on your criteria. Ebooks are less expensive to produce. You can store many books on one device and easily carry it from place to place. I get that. 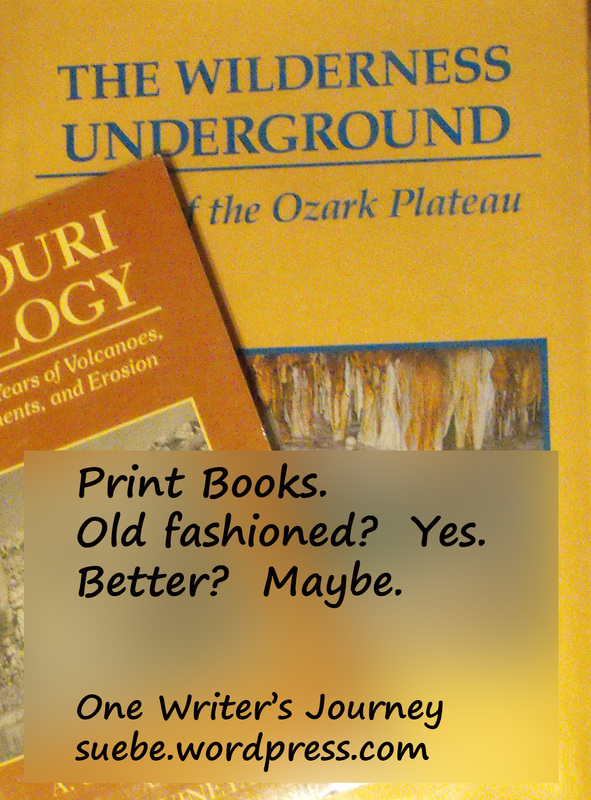 That said, I prefer print. I read ebooks when I’m on the treadmill. That’s because I have a treadmill desk and it is easier to read electronic books on my lovely screen that is generally bigger than the print book. A lot of the research for my Maya book came to me as PDF files of various journal articles. It was too much to print out so I worked from the screen. In spite of this, I still prefer print. Up until I read this article, I thought that maybe it was just me, but I seem to connect better with things that I read in print. But a recent study of Norwegian 10th graders produced some surprising results. One group of students were given a piece of fiction and a piece of nonfiction in print form. The second group received the same two pieces as PDF files. The researchers had already tested the students reading skills and vocabularies so that doesn’t account for the differences. When asked questions that tested their understanding, the students who read the PDF versions scored noticably lower on both the fiction reading and the nonfiction reading. The researchers don’t know yet what causes this disparity but they did put forth a theory about mental maps. Because a print book is a tangible, physical thing, reading it combines a stronger visual and tangible experience to create a mental map. Because readers can page back and forth in a longer work, they are better able to review the content and form relationships between different portions of the text. Other studies show that readers are more emotionally involved in a text that they read in paper form. Part of the reason that I find this so interesting is that many schools are presenting text books and other information in electronic form. Should we be concerned? If you are writing picture books, one way that you can end your story is with a surprise like the one Adam Rubin gives his readers in Dragon’s Love Tacos (Dial Books for Young Readers). In this story, the narrator tells the child character all about dragons and their love for tacos. He discusses toppings dragons love and toppings dragons despise. He even goes into what will happen if you mistakenly give a dragon one of these forbidden toppings and just how dangerous this can be. Warning in hand, the child then plans a taco party for the dragons. Unfortunately, he doesn’t see one of the ingredients in the salsa until it is too late. . .
Because he misses the hot peppers in the tacos, the dragons spark and shoot flames. This might be okay in a dragon cave but in a house? It burns to the ground. Nope. Not exactly the ending that you expect in a picture book. Daniel Salmieri’s illustrations make the whole thing humorous but it still comes as a surprise. After all, the worst thing most of us have ever experienced at a party is a spilled drink or a minor injury. Belched flame is outside our experience. This isn’t the cute picture book ending that we expected at all. But it isn’t so far out there that we can’t accept it. Rubin hinted at this ending. From the start, the child is warned that spicy toppings make smoke come out of dragon ears and they snort sparks. 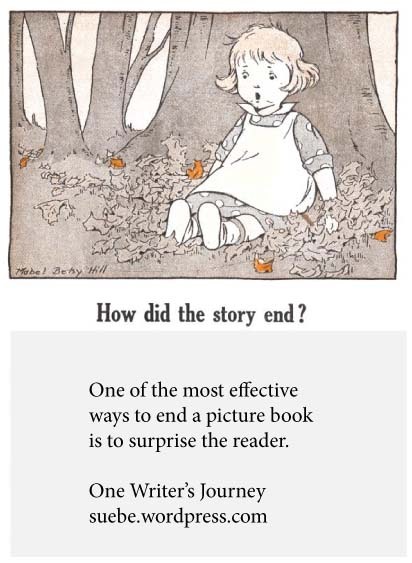 One of the most effective endings for a picture book is the surprise ending. At the first reading, the reader is surprised. During subsequent readings, he enjoys being in the know. Just make sure that you plant the clues that make your ending, even if its as fantastic as fire belching dragons, believable. Author/blogger Jen Mann is seeking letters of advice for teenagers for two different anthologies. The books are letters of advice, one for girls and the other for boys, to teenagers who are about to move out on their own. Emphasis — make it hilariously funny. What: Original humorous essays giving advice to teen boys or teen girls. Read the full guidelines here before you submit. I know. I didn’t even give you the contact information but that’s because you need to check out the guidelines. 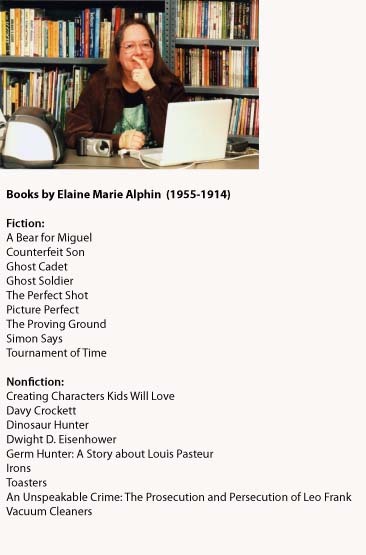 The world of children’s publishing lost an amazing author with the death of Elaine Marie Alphin on August 19, 2014. Usually, when I post about someone important in our field, it isn’t someone with whom I’ve interacted. Fortunately, I had to priviledge to learn from Elaine. When I started writing, Elaine was already established. She wrote both fiction and nonfiction (see below). It always surprised me how dark much of her fiction is because Elaine was always a bright soul, a cheerleader for new writers, answering questions and giving us the encouragement to keep working. Elaine will surely be missed. Why not pick up one of her books and get to know an amazing writer? Challenge yourself, and your reader, by exploring poetry types. 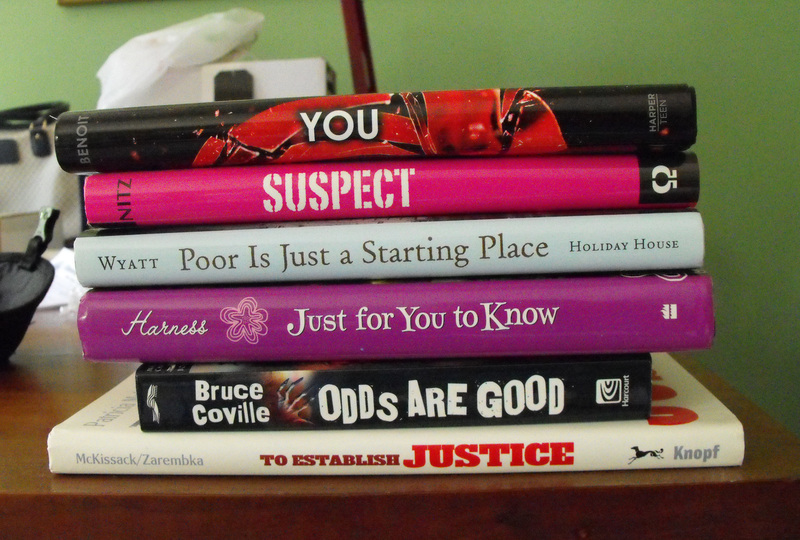 Book spine poem, anyone? Book Spine Poem: Every line in this poem comes from the spine of a book. Not as easy as it sounds. Sensory poem: How many senses can you work into one poem? Tanka poem: At only five lines, this one is good for new poets. Terse Verse: The answer to a riddle comes in two rhyming words. I’m not a poet, so when I write a poem-based activity, I often stick with shorter poems for younger students. What can I say? I know my limits. 50 poetic forms for poets. This list is for poets so there’s no concern about what may or may not be too hard for young readers, or non-poet writers, to duplicate. Types of Poetry. Comare these two lists and you’ll see that they sometimes call one type of poem by more than one name. Introduction to Poetry Types. A list of over 100 types. Only three lists but lots and lots of poems. Have fun experimenting with something new! I know I will . . . Joseph’s Star looks fun. The very best fictional stories have a strong message. Some touch on loyalty or family. Others make us think about faith or forgiveness. Whatever the message is we have to be careful how we deliver it. Come on too strong and your work seems preachy. The problem with this is that if you nag from the pages of your story and no one will want to read it. It works best when your characters discover the message for themselves in the course of the story. Merrie Haskell did an amazing job of this in The Castle Behind Thorns. Admittedly, I might have been impressed because of the timing. I read this book during the unrest in Ferguson, Mo. I’m one town over. My sister and her family live in Ferguson. Quite frankly, a lot of people in our community need to read a book about letting go of anger. IF YOU HATE SPOILERS DON’T READ THE REST OF THIS POST BEFORE YOU READ THE BOOK. On the surface, this is a retelling of Sleeping Beauty. Sand has grown up in sight of the castle but no one goes there. In fact no one pays much attention to it. Then one day he wakes up in the fireplace in the main hall. Only after a merlin and the princes “wake up” does Sand begin to unravel why he is there, what caused the brambles to grow up around the castle and why they are so dangerous. The princess was killed, more or less by accident. Her step-mother meant to put her into a deep sleep. She tricked a servant into administering the potion. The brambles arose from the girl’s grave because of the hatred she had for her step-mother. Only by letting go of these feelings could the brambles be fully dispersed. This is a novel, so obviously there’s a lot more to it than that but this is a lesson that the author could have shoved right in the reader’s face. Instead, the reader meets the girl and learns of the harsh treatment she suffered at the hands of this woman as no one stood up for her. But these two women aren’t the only ones holding onto anger and hurt. Sand must begin mending things to get to the bottom of it all, both in the girl’s life and in his own. Readers receive the message only through the plot. Both plot and subplot support the same message. Added together this is much more effective than tapping a twelve year old on the shoulder and telling her to let go and quit being a pill. How can you work the message into your own story? Read The Castle Behind Thorns and other books that do it well to collect ideas. 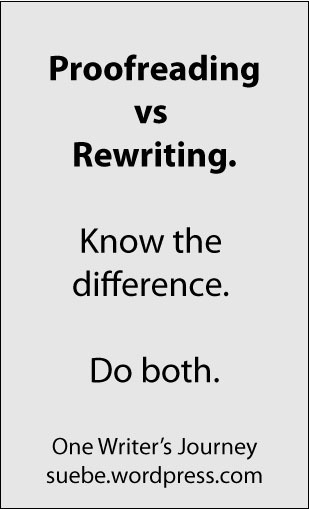 Rewriting vs Proofreading: Do you know the difference? Writers need to know how to both rewrite and proofread their work. One without the other is only half the job. But to do both, you have to know the difference. I always think of rewriting as working on the big picture. This is when I fix plot and character and setting. This is the time to solidify theme, work in concrete details and play with the word choice. For picture books, it is when I make sure the piece is a fun read-aloud. Are there enough spreads? Does something concrete happen on each spread? I also make certain that I haven’t done the illustrators job. In nonfiction, I play with the introduction and the conclusion. These are easier to craft once I know where the piece will begin and end. I also smooth out transitions making certain that I get the reader from one sub-topic to another without any major bumps. Rewriting is a lot of work in part because I may have to do it 6 or 10 times. It all depends what I’m writing but whether it is a picture book or a review, I can only fix so much in one sweep. Unfortunately many writers proof and call it rewriting. Nope. Sorry. If all you do is shift a few commas and fix typos, that is not a rewrite. Proofreading is the final polish. This is when you fix spelling, grammar and punctuation. Unfortunately, these itty-bitty errors can be hard to spot. For more on how to do that, check out my post for today at the Muffin. Two different theme-based calls for submissions. The first is from Appleseeds. As you know, Appleseeds is part of the Cricket group. 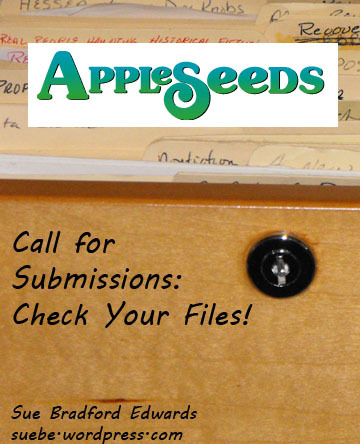 The magazine is theme based and one of the upcoming themes is still open for submissions. The July/August 2015 issue will be titled Check Mate: Chess and Other Games. This issue isn’t just about the games themselves but also about the people who play, win and make them. The query deadline is 10/1/2014. Before you submit to this publication, be sure to read the full guidelines. The other call is from Pockets magazine which is owned by the Upper Room. Their first open theme is Hope with a deadline of 09/01/2014. This is an Easter based theme and will focus on how the knowing of a loving God helps us hope in spite of situations that appear hopeless. The second theme is Family Challenges with a deadline of 10/01/2014. The purpose of this theme is too look at the challenges that families face, including scheduling, siblings, rules and more. 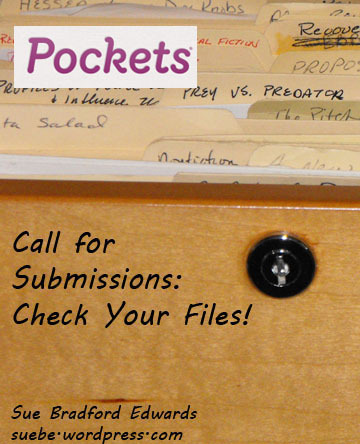 Pockets publishes fiction and nonfiction from 600 to 1000 words. These pieces should deal with situations faced by young readers. Avoid talking animals and objects. Biblically based stories must remain faithful to the Biblical account. Poems should be 20 lines or less and either seasonal or related to the theme. See their guidelines here. Good luck sending in your work! Every once in a while, someone brings a manuscript to critique and says “I’m not sure if its a picture book or a magazine piece.” Until you know, you can’t do much more than rough it out. 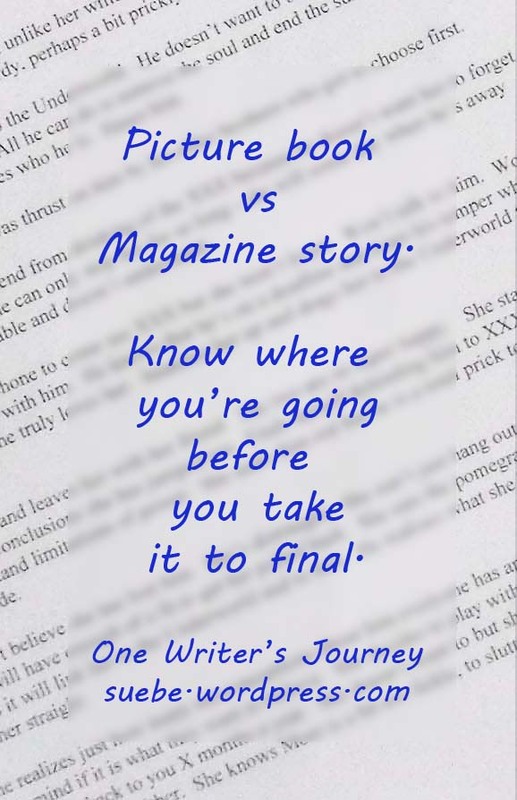 Here are some key differences between picture books and magazine stories. Printed in approx. 14 spreads. Each spread must present a new action, emotion, combination of characters, setting or mood. Each spread must include something to illustrate. 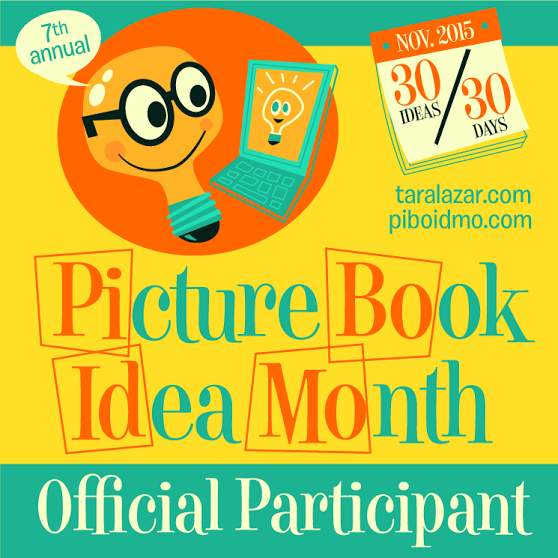 A picture book is meant to be read aloud. Keep visual discription to a minimum. This is the illustrator’s territory. The illustrations tell part of the story. Much more variable in length. Can take place in a single setting. You can use more dialogue than in a picture book (illustrators don’t want to painting talking heads). You can be more discriptive. Text has to convey the entire story because the illustrations won’t do half the job. Picture books and magazine stories can both be written for similar age groups (preschoolers). They can be about similar subjects (animals or holidays or shapes). They can both by mysteries or they can make you laugh out loud. How they do it is going to vary depending on your form. You might be able to rough the story out before you make a decision but you cannot take it to final until you know where you are going.